One last family favorite recipe to share with you. If your menu is already planned out, I highly recommend you add this to it. 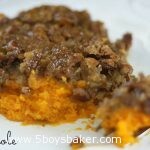 I know there are sweet potato casserole lovers and haters out there. If you happen to be one of those haters, this casserole could possibly convert you over to the other side– my sister-in-law is living proof. It’s divine! My Aunt made this years ago and we all fell in love with it. We’ve eaten it every year since and because I could eat the entire pan, I’m the one who happily volunteers to make it so I can take home the leftovers. The yams are smooth and velvety and the topping is crunchy and sweet—it’s really like you’re eating dessert rather than a side dish. I am absolutely in love with this dish! I hope you all have a fabulous Thanksgiving. To prepare yams, place them in a large pot; cover with water. Bring to a boil. Reduce heat, and simmer 20 minutes or until tender; drain. Cool. Place potatoes in a large bowl, brown sugar, eggs, melted butter, salt, vanilla, nutmeg and milk. Beat with a mixer at medium speed until smooth. Pour potato mixture into a 13 x 9–inch baking pan coated with cooking spray. To prepare topping, combine all ingredients and mix until combined. Spread evenly over yam mixture. Bake at 350° for 30 minutes or just golden.